BATON ROUGE, Louisiana, January 23, 2019 (ENS) – More than 750 million people don’t get enough nutrients from their food, and that worries Herry Utomo, a professor at Louisiana State University. The majority of these people live in communities that eat lots of rice. He reasons that rice bred for extra protein could enhance the nourishment they get from each bowl. Utomo and his team have developed a high-protein line of rice cultivar, called Frontière, which was released in 2017. This rice, developed through a traditional breeding process, is the first long grain, high-protein rice developed for use anywhere in the world, Utomo says. It has a protein content of 10.6 percent, a 53 percent increase from its original protein content. It needs less heat, time, and usually less water to cook than conventional rice. This high-protein cultivar is currently grown commercially in Illinois and marketed as “Cahokia” rice. The Cahokia were an Algonquian-speaking Native American tribe and member of the Illinois Confederation. Five Cahokia chiefs and headmen joined those of other Illinois tribes at the 1818 Treaty of Edwardsville in ceding to the United States half of the present state of Illinois. The Cahokia high protein rice is grown on land alongside the Mississippi River they once planted with corn, until the U.S. government moved the tribe first to Kansas and then to Oklahoma. They are now considered extinct. Hundreds of years later, the Gerard family settled on the same land once farmed by the Cahokia. In 1990, descendant Blake Gerard returned to the land and began to grow rice. Gerard uses what he calls “best-in-class soil conservation practices” to maintain its natural fertility and reduce the farm’s environmental footprint. To purchase Cahokia high protein rice contact: sales@cahokiarice.com. Today, at Louisiana State, Utomo is finishing up development of a new advanced line, with higher yield, because breeding a crop for more nutrients like protein can cause the yield to decrease. 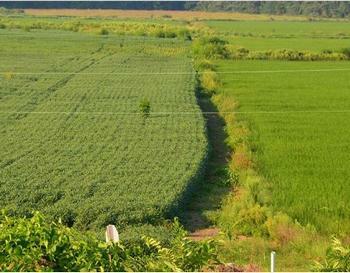 Researchers tested a total of 20 new lines of high-protein rice to see if any would produce a higher yield. Their data showed the new high-protein lines improved yield by 11-17 percent compared to the yield of the first high-protein line. Grain quality characteristics varied. Their selection of the best line is ready for final field testing prior to release. Utomo says researchers developed high-protein rice because there is a growing market for new products that can offer more nutritional value from major food crops, including rice. The high-protein rice can be eaten eaten plain, of course, and it can be processed into specialty foods that can then provide higher nutrition. Many products, from the rice flour used in baked goods to rice milk, baby foods, cereals, and crackers, contain rice, and could benefit from more protein. 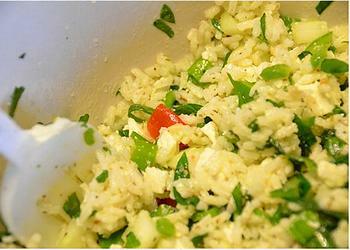 Rice is gluten-free, a major advantage in the marketplace. Researchers hope these newer lines will ultimately be bought and grown by more farmers. 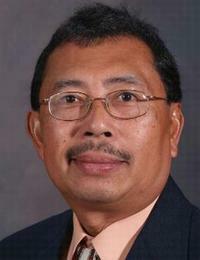 Utomo presented this research November 7 at the Annual Meeting of American Society of Agronomy and Crop Science Society of America in Baltimore, Maryland. The USDA National Institute of Food and Agriculture and the Louisiana Rice Research Board funded the project.